Can you really buy a home in an IRS real estate auction for a few hundred dollars? If you get very lucky, yes. The reality is you can buy homes at an IRS real estate auction, but you will likely pay more than a few hundred dollars. You can still make big profits by investing in IRS auctions if you know the rules and do your homework. Here’s one example. The IRS seized a house in Canon City, CO. The opening bid was $35,400. A quick check on the real estate information website Zillow shows the house is worth $102,672. The IRS wanted about one-third of the home’s value. The “Zestimate” for renting the house showed an owner could expect to get about $900 a month for it. Zillow also said financing would run about $378 a month. When the IRS takes property to sell, it only wants to collect the past due taxes. You just have to do your homework and know the rules before you start investing in IRS real estate auctions. The IRS holds two kinds of auctions. Registering for either auction can be different. “Potential bidders would be best prepared by requesting a copy of the Notice of Public Auction or Notice of Sealed Bid Auction and perusing same for instructions and requirements for that specific sale. A copy of Notice of Sale can be reviewed on our Web Site,” the IRS says on a frequently asked questions (FAQ) page. You must know the rules for each auction to be successful. A public auction is just what it sounds like. It is an auction open to the public. If you register for the auction and have enough money to bid, you can participate. The IRS does not hold online auctions. You should attend the auction or have someone represent you. “Most IRS auctions will allow some form of mail-in-bid, but it would behoove a potential bidder to obtain a copy of the Notice of Sale for instructions and limitations,” the IRS FAQ page says. In other words, you need to know the rules. Some public auctions allow mail-in bids. Some don’t. You have to know the rules for each auction. In a public auction, you may be bidding against other people. The final sales price may be more than the opening bid. This is why you need to know the rules and do your homework. You have to know how much you are willing to spend. Set a budget and stick to that. If the house sells for more than you are willing to spend, do not worry. The IRS conducts auctions around the nation regularly. A sealed bid auction is open to the public, but you put your bid on paper, seal that in an envelope and mail to an address set by the IRS. You don’t know what other people are bidding. They don’t know what you are bidding. The envelopes are opened and the highest bid gets the property. This is also why you have to do your homework. You need to know what you can spend. If you do not get the house, again, do not worry. The IRS holds auctions frequently. A chance to bid again will come soon. A sealed bid is similar to mailing in a bid. The difference is everyone at the public auction will see your bid at the Public Auction. They may raise the price and out-bid you. One thing that separates an IRS tax auction from county tax defaulted property auctions is other liens. When a tax defaulted property is sold by a county in most states in the United States, that sale sets aside the mortgage. You can read more about county tax defaulted property auctions at my website Members.TedThomas.com. An IRS auction does not set aside a mortgage. “An IRS lien does not trump the mortgage lender’s right to recover a defaulted home loan through foreclosure. Thus, the IRS may foreclose on and seize the property but must pay the mortgage lender the remaining amount owed on the mortgage when doing so,” says an article in the San Francisco Gate, the website for The San Francisco Chronicle newspaper. The IRS won’t take a home and sell it unless the federal agency is certain it can get the past due taxes out of the sale and enough to pay off the mortgage. If a home has a mortgage, the IRS knows that must be paid off first. If the IRS can’t get enough money from the sale to pay off the mortgage and the taxes, it won’t sell the house. Most of the time when the IRS sells a house, it does not have a mortgage or very little is owed. 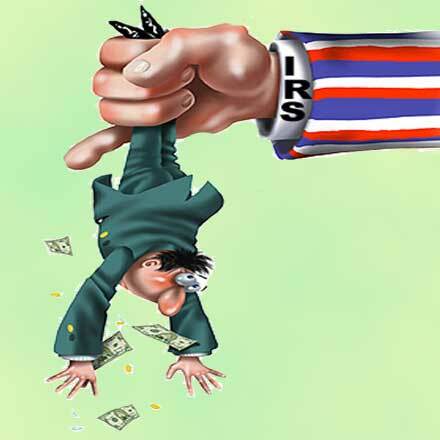 The IRS does not want to be stuck paying off the mortgage. Another lien you need to know about is local property taxes. Sometimes the IRS listing will mention local property taxes. You need to know if local taxes are owed and how much they are. This is part of doing your homework. Call the county tax collector where the property is located. Give the property address information. The tax office has to tell you if the taxes on the property are current or past due. If past due, they have to tell you how much is owed. You can also research the past due property taxes online. Sometimes the IRS will add that into the minimum bid, but you should not count on that. Any past due taxes have to be figured into your purchase price. Protect your investment from a local tax defaulted property auction. You can find other federal agencies that sell homes at auction at the federal government’s auction website. Six federal agencies sell real estate, all of which are listed on the website. Only the IRS sells homes for past due taxes. The other agencies sell homes as foreclosures. You can buy these homes and make a profit, but you must know the rules and do your homework. The rules for the auctions are different for each agency and sometimes each auction. “Each auction website operates differently. In some cases, the auctions are operated completely by the government agency, while in other cases the agency only operates the shopping site, but a third-party company handles the auction itself,” the website states. Doing your homework means learning as much as you can about the property. The IRS auction listing on the Treasury website will give you some basic information about the property. Most likely, it will not be enough for you to make an informed investment decision. Most listings also contain contact information for an IRS property appraisal and auction specialist. You can contact that person for more information. Zillow, which I mention above, is one of the best online tools for property research. You can find out zoning, square footage and the value of the property. I have videos on my website, Members.TedThomas.com, that teach you how to use Zillow. Once you join you’ll have access to many more videos that teach you how to make big profits investing in tax defaulted real estate. You can watch the videos as often as you need to. The videos teach you how to property research. IRS public auctions and sealed bids sell property for a fraction of the fair market value. You can make big profits investing in them if you do your homework and know the rules. Ted Thomas is a Florida-based author and publisher who specializes in tax defaulted properties. Visitors to his website www.tedthomas.com will find 4 must see FREE instructional videos. No credit card required. The video lessons will give you everything you ever wanted to learn about government tax defaulted real estate which is sold at public auctions for starting bid, back taxes for 10 cents to 20 cents on the dollar. You’ll also learn the secrets of tax lien certificates which pay guaranteed returns of 16%, 18%, up to 36%. Go to www.tedthomas.com for more information.